For the second year in a row, the foremost internationally peer-reviewed conservation journal Studies in Conservation (SIC) has featured research from the Worcester Art Museum on its cover. Distributed globally, SIC reaches scholars around the world, helping to raise awareness of WAM's world class collection and the exceptional work taking place in the conservation department. 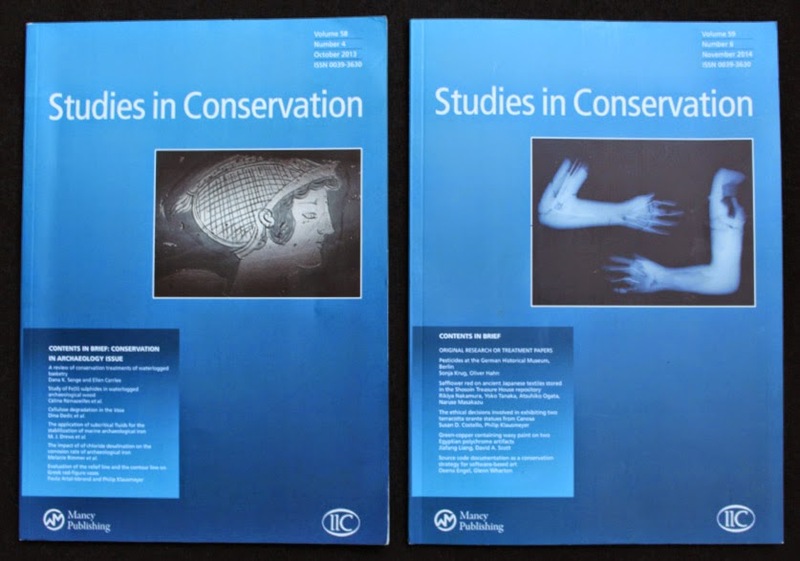 The October 2013 and December 2014 editions of Studies in Conservation also featured images on their covers from the Worcester Art Museum research articles published therein (see photograph above). The two articles, Evaluation of the relief line and the contour line on Greek red-figure vases using reflectance transformation imaging and three-dimensional laser scanning confocal microscopy, co-authored by Paula Artal-Isbrand and Philip Klausmeyer, and A Re-united Pair: The conservation, technical study, and ethical decisions involved in exhibiting two terracotta orante statues from Canosa, co-authored by Susan Costello and Klausmeyer, focus on works that are currently displayed in the gallery of Greek Art. Publications like these are just one of many ways the conservation department seeks to care for, expand our knowledge of, and draw attention to the outstanding works found at WAM. Such articles not only assist other conservators working on similar objects elsewhere, but also help to develop contacts with curators, art historians, scientists, and archaeologists. 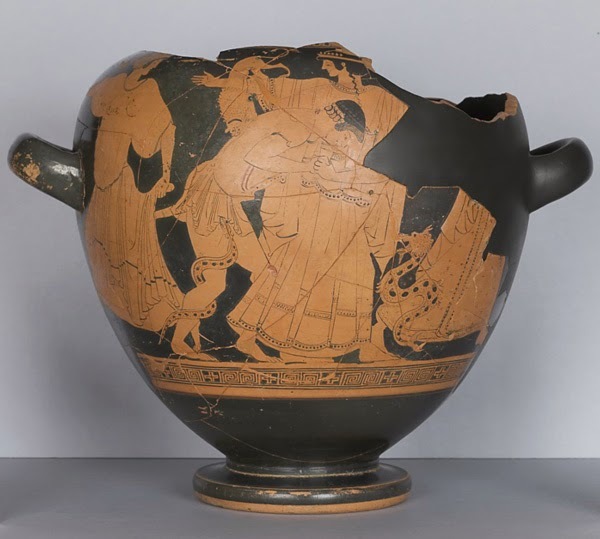 Above Left: Conservation treatment of the Worcester Art Museum's Greek stamnos attributed to the Tyszkiewicz painter, c. 480 BCE (1953.92) helped launch the larger research project published in the October 2013 edition of Studies in Conservation. 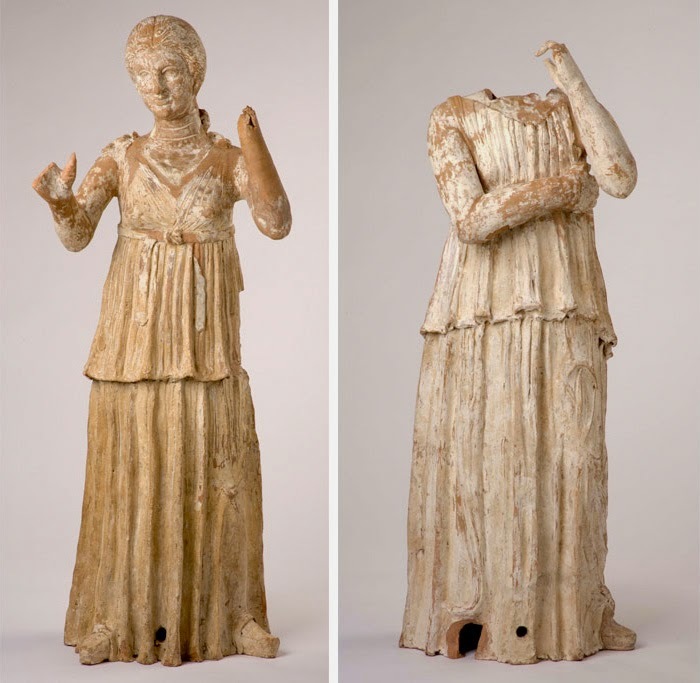 Above Right: Conservation treatment and analysis of the museum's two rare Orantes (funerary figures) from Southern Italy , 3rd-4th century BCE, is the subject of an article published in the December 2014 edition of Studies in Conservation.